Sock screen strainer designs are inserted into the I.D. of your stainless steel tubing and provide filtration for a greater soil retention. 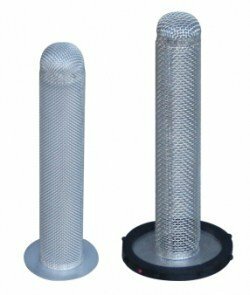 The extended sock shaped mesh gasket offers up to 300% more open area for 300% more soil collection capability than conventional screens. They provide greater flow for situations where a large amount of particulates are involved. Due to the large capacity and open screen area, sock screens require less service, therefore, reducing down time and costly changeouts, a major consideration with inline pharmaceutical processing.